July news: Shows all over Oregon! Happy summer! I hope your family is enjoying the sunshine and all the fun times that come with it. My summer is going great–I mostly finished my upcoming album, The Deep Woods (which I hope to release in September), and just returned from a much-needed vacation. Now I hit the ground running with library shows all over the state. 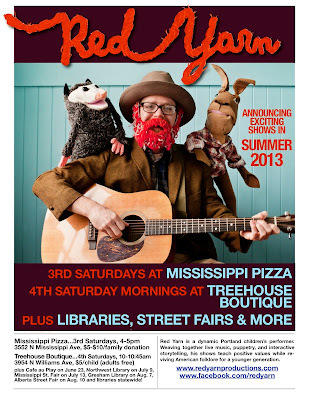 I’m performing a new show called Red Yarn’s Garden Tales, which combines some of my best stories, songs and puppets with new material (including a precious new critter named Gracie Groundhog). If you are in Portland, you can catch the debut at 3pm this Tuesday, July 9th at Northwest Library or in the suburbs throughout the summer. I’m also performing locally most weekends, including this Saturday, July 13 at 4:30pm during the Mississippi Street Fair. Below you’ll find all of my performance dates in July. If you have family or friends in the towns where I’m headed, please forward this along to them! In August I’m leading two summer camps–“Puppetpalooza” week at KCLC from August 5-9 and “Friendly’s Got Talent” music camp at Friendly House from August 19-23. If you’re looking for a fun, creative option for your school age child, check out these camps. You can get updates on my shows, album and other adventures by following me on Facebook, Twitter & Instagram. I hope to see you and your family soon! http://redyarnproductions.com/wp-content/uploads/2016/04/bright-red-logo-for-web1.jpg 0 0 Red Yarn http://redyarnproductions.com/wp-content/uploads/2016/04/bright-red-logo-for-web1.jpg Red Yarn2013-07-08 14:21:002013-08-30 10:51:06July news: Shows all over Oregon! Red Yarn will lead audiences into the Deep Woods, a magical forest inhabited by the animals of American folklore. Mixing live musical performance with puppetry and interactive storytelling, this program engages children with the songs and stories of our national heritage. I’m excited to team up with PDX Kids Calendar to offer a fun puppet craft at the opening day of this wonderful market. Come make Crazy Critter Puppets with paper, fabric, and other cool recycled materials! 1-3pm. $7/adult, $5/walking child, free album download with admission. To celebrate the release of “Songs for Johnson Creek,” a benefit album with tracks by 12 local kindie artists, Matt Clark has organized this awesome release show. Other performers include Matt, Mo Phillips, Mr. Hoo, Tallulah’s Daddy, and Buttercup Bill Aubrecht. Not sure what time I perform, probably near the beginning. The first installment of my summer residency at Mississippi Pizza, every 3rd Saturday from 4-5pm! 9:30-11am. Free, plus advance mp3 of a song off the album for participants. I hope you and your family can come help record vocals, stomps and claps for my new album! More info above. 10-10:45am. $5/child, adults are free. The first installment of my summer residency at Treehouse, every 4th Saturday from 10-10:45am! 10-10:45am. $3/walking person suggested donation. I’m excited to fill in for the Alphabeticians at their regular Sunday morning show at Cafe au Play. I hope to see you and your family soon! Holy cow, it’s already May! Things are moving right along here at Red Yarn Productions–making progress on my new album, The Deep Woods, enjoying all my shows and the sweet families who come out each week, and leading several school residencies and afterschool classes. In other news, Red Yarn has finally entered the 21st century: you can now follow my adventures on Twitter and Instagram, in addition to Facebook. I still need a better website–if you or anyone you know is a web designer, please contact me! 10:30am-4pm (I perform from 12-12:45). $5/person. I’m honored to be a part of this event organized by the Columbia Association of Puppeteers. I’ll be performing my “Deep Woods” show. Other performers include Tears of Joy Theater and Dragon Theater Puppets. Visit the webpage for more info. Kennedy School with Mo Phillips! Yessss! I’m opening for the amazing Mo Phillips and his full band at this very special show. I perform for ~30 minutes starting at 6pm. Tickets are only available at the door, so you should show up early. In this musical puppet show, Red Yarn will lead audiences into the Deep Woods, a magical forest inhabited by the animals of American folklore. Mixing live musical performance with puppetry and interactive storytelling, this program engages children with the songs and stories of our national heritage. A reminder: due to a busy schedule of out-of-town shows and summer camps, my regular shows will go on hiatus after the first week of June and resume in September. Don’t worry, I’ll be performing local shows throughout the summer. 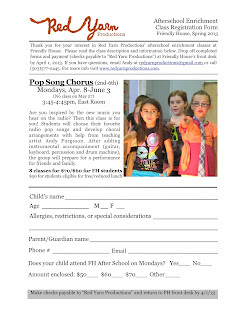 I’m also leading summer day camps for school age kids at Friendly House and KCLC; check out my April newsletter for more info. Whew! Thanks for all your ongoing support. I hope to see you and your family soon! Happy Spring! Surrounded by so many signs of nature’s renewal, I hope you and your family are finding your own rejuvenation. Here at Red Yarn Productions I’m looking forward to a relatively calm April and May before a busy summer of out-of-town shows and camps. Just a heads up: my regular shows will go on hiatus in June and resume in the fall. I will miss seeing so many of your sweet families each week, but welcome the opportunity to reach families all over Oregon. I’ll have some local shows, just not so often. Some of you have asked when I’m making an album. I’m finally digging into recording this month! I’ll post updates on my Facebook page, including information about a community recording session for backing vocals, stomps and claps. I hope to release the album sometime this summer. Below you’ll find my regular show schedule this month, plus info about special events and summer camps for school-age children. 6:30-7:30pm. $5-$10 suggested donation per family. 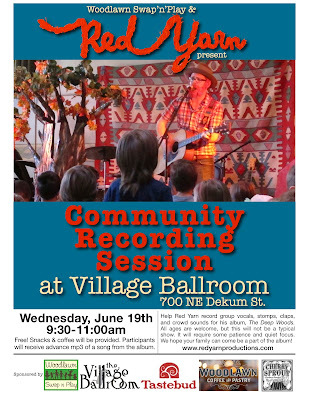 Families are invited to bring acoustic instruments for a raucous all-ages jam session. All skill levels are welcome! 11:00-11:45am. 7860 SE 13th Avenue. Free! Red Yarn presents an exciting new musical puppet show inspired by Robert and Daniel San Souci’s book Sister Tricksters. This performance features two of American folklore’s unsung heroines – Molly Cottontail and Sis Goose. Children will sing, dance and act out parts of the show as they enjoy the adventures of these clever female tricksters. Students will build puppets, create a show, see performances by local puppeteers, and visit the Oregon Zoo. Students will learn about different music genres, form bands, write and perform songs, and visit PCPA. Thank you as always for your continued support. I have to pinch myself each day to believe that I’m living this dream. You and your families make it possible! Howdy from Red Yarn Productions! Another busy month has flown by, and March promises to be just as packed. Please find information below about special shows coming up (including several weekend dates), my regular show schedule in March, and spring afterschool classes. I’m especially excited for the March 9 debut of Sister Tricksters, a new library program inspired (and endorsed) by children’s author Robert San Souci. A quick note for those of you looking for school age summer camps: I’m leading a puppet camp at KCLC from August 5-9 and a music camp at Friendly House from August 19-23. Visit their websites for more info. For more regular updates about shows, classes, and other projects, follow Red Yarn on Facebook! 4:00-5:00pm. 3552 N. Mississippi Ave.
$5-$10 suggested donation per family. 10-10:45am. Mommy & Me Mondays. 11:00-11:45am. 7510 N Charleston Avenue. Free! 5:00-6:00pm. 3552 N. Mississippi Ave.
11:00-11:45am. 5 Academy St., Lebanon, OR 97355. Free! 1st & 3rd Wednesdays, 10:30-11:15am. $3/walking person. 2nd & 4th Wednesdays, 10-10:45am. $5/family. Thursdays, 10-10:45am. $5/child (free for adults). Are you inspired by the new music you hear on the radio? Then this class is for you! 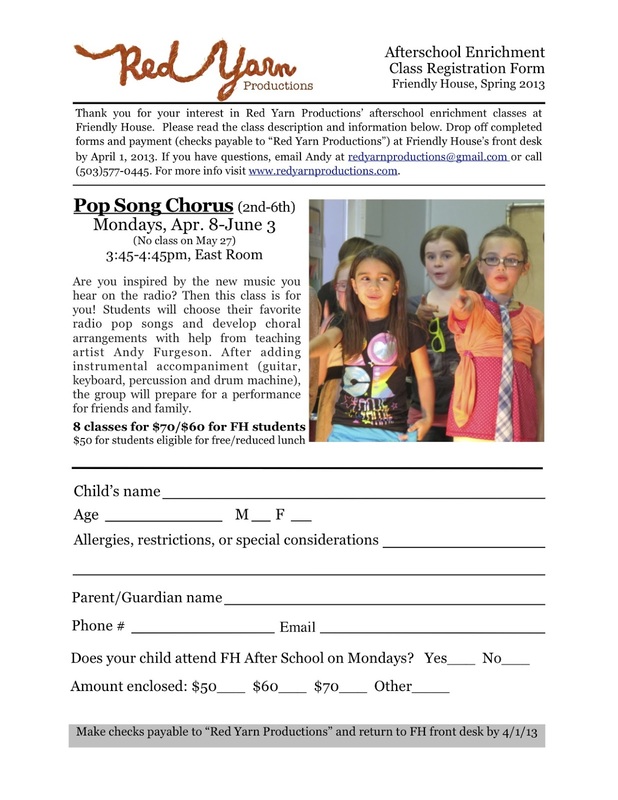 Students will choose their favorite radio pop songs and develop choral arrangements with help from teaching artist Andy Furgeson. After adding instrumental accompaniment (guitar, keyboard, percussion and drum machine), the group will prepare a performance for friends and family. Let’s save the planet… one puppet at a time! In this 9-week class, students will practice creative reuse by building puppets from recycled materials and papier mache. After decorating their puppets with paint and cloth, students will write an environmentally-themed musical puppet show. Finally, they’ll perform their show for family and friends. Happy February! It’s another busy month for Red Yarn Productions, so I want to let you know about upcoming events and a few slight changes to my regular show schedule. Please note that I start my new 1st & 3rd Wednesday mornings at Milagros tomorrow (10:30am), I’m leading another Family Jam at Friendly House this Friday evening, and I’m performing a new show, A Horse Named Bill, this Saturday morning at Albina Library. After the great success of the first Family Jam in November, we’re making this a more regular event. Families are invited to bring acoustic instruments for a raucous all-ages jam session. All skill levels are welcome! 10:30-11:15am. 3605 NE 15th Avenue. Free! Join children’s performer Red Yarn and his best friend – a talking horse named Bill – for this engaging musical puppet show. Audiences will journey across the country with Bill and Red, sharing adventures through a mystical desert to the Wild West as Red Yarn weaves classic horse songs together with puppetry and interactive storytelling. 10:30-11:15am. 585 Liberty St SE, Salem, OR 97301. Free! 6:30-7:15pm. 13793 Southeast Sieben Park Way, Clackamas, OR 97015. Free! 4:00-5:00pm. 3552 N. Mississippi Ave. $5-$10 suggested donation per family. 10-10:45am. Mommy & Me Mondays. Included with museum admission. – Cafe au Play, Tuesdays, 10:30-11am. Milagros Boutique, 1st & 3rd Wednesdays, 10:30-11:15am. – Woodlawn Swap’n’Play, 2nd & 4th Wednesdays, 10-10:45am. – The Treehouse Boutique, Thursdays, 10-10:45am. – Warehouse Cafe, Fridays, 10-10:45am. As always, thanks for your support! You can follow me on Facebook for more regular updates. I hope to see you and your family at a show or event soon! Hello! Here’s an update about my school offerings and my show/event schedule, with more out-of-town library shows and a few changes in my regular gigs. Please note my special show at Lilikoi Coffee tomorrow, Monday, from 10-10:45am, and the next Family Jam at Friendly House on Friday, February 8. I recently added a performance program to the Young Audiences roster. It’s called “The Deep Woods: Animals in American Folksongs” and it’s geared toward PK-3rd graders. If your child’s school is looking for an engaging musical puppet performance for an assembly or family night, please recommend me! I continue to offer my “Folk Song Puppet Show” residency through YA, and I joined the Right Brain Initiative‘s roster of teaching artists in the fall. I should be available for residencies/performances through Right Brain in the spring. Thursdays, 10:15-11am. $5/child (free for adults). Milagros Boutique has been Fridays, 3:30-4:15pm. January 18 will be my last Friday afternoon there for a while, as I’m starting a new afterschool class at Bridlemile. In February and March I’ll be at Milagros on the 1st & 3rd Wednesday mornings, 10-10:45am(alternating with Woodlawn Swap’n’Play). We’ll see how that goes and possibly switch back to Fridays afternoons in April. $3/walking person. 10-10:45am. 2620 SE Powell Blvd. $5/family suggested donation. This sweet spot is booking more family entertainment lately, so I’m happy to have a chance to perform there. 6:30-7:15pm. 292 N. Holly, Canby OR 97013. Free! 6:30-7:30pm. $5-$10 suggested donation per family. After the great success of the first Family Jam in November, we’re making this a more regular event. Families are invited to bring acoustic instruments for a raucous all-ages jam session. All skill levels are welcome! Thanks for your ongoing support. Follow me on Facebook for more regular updates. I hope to see you and your family at a show or event soon!